bialecki has posted a new photo. Subject: 30 Gallon Diesel Caddy. 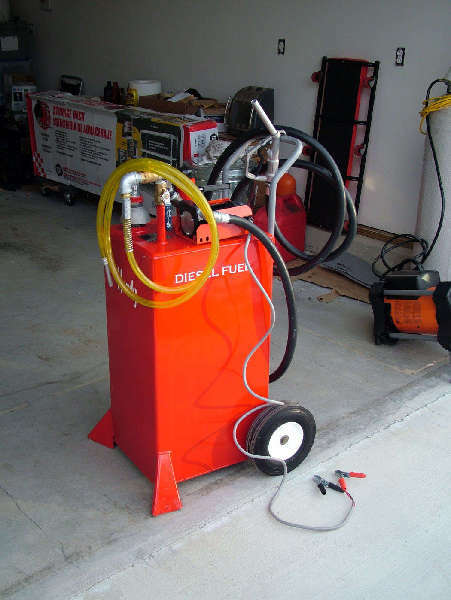 Description: 30 Gallon Diesel Caddy from Northerntool.com with 12Volt 5 GPM fuel pump. This fuel caddy from Northerntool.com has worked out nicely for me. I initially purchased it with the hand crank pump (as supplied) and a 14 foot fuel line with a manual nozzle. The problem was I had to have the tractor or fuel caddy next to one another while filling. One hand cranked the other was squeezing the nozzle lever while I watch the level of the fuel as I filled the tank. A bit of a pain. So over the Christmas break I ordered a 5 gallon/ minute pump from Northern ($69.00) and plumbed it to the caddy. The thing that most people dislike about filling a tractor, especially the one on my Kubota B7800 is that I would have to lift a five gallon container (approximately 35 pounds) chest high and hold it there while it chugs along filling the Kubota's tank. Additionally, Kubota has a cross brace from the FEL that goes right over the fuel cap which makes it more difficult to fill. So I did a little research and found the pump offered by Northern. (I also looked at the Tothill pumps, very nice, but much more money). The Northern pump being very well constructed (Cast iron head, bronze impeller and an On/Off switch) fit my needs exactly. So I plumbed it so I can transfer diesel from my 5 gallon containers into the caddy (or tractor) with a flip of a ball valve. I usually fill the caddy then transfer fuel from it to the tractor. I figured why not add the extra ball valve and fittings so I can pump from the cans as well. Once again not having to lift the containers to fill the caddy. I'll attach a photo showing the plumbing. So far I like it. Now here's the silly question of the day. Diesel fuel weighs 7.3 pounds per gallon, so 30 gallons would weigh 219 pounds. The Northern Tool website say the caddy itself weighs 106 pounds and the pump is another maybe 10 pounds. So, all in, tank, pump and fuel weigh about 335 pounds. How do you fill it? If you drive it to the filling station in a truck or trailer isn't unloading it kind of a PITA? I fill my three 5 gallon diesel containers at a time at the station, then I now use the newly installed pump to fill the caddy. Over the summer I had to lift and hold the containers while I filled the caddy. That did not make any sense to me because I was not saving any effort filling the caddy versus filling the tractor. The pump now draws from either the 5 gallon containers or the caddy. The fully filled caddy is heavy (thanks for calculating the weight for me) that is why I like having the 14 foot fuel line with the manual nozzle, I usually leave the caddy in the corner of my garage. The pump is a centrifugal pump so I can have it on (dead headed it) until I depress the nozzle lever to start the flow of diesel. Ahh, a man after my own heart, who does the hard work with his head not his back. I like your diesel caddy, but I'm just too cheap to go buy one. My solution to the problem was to install an 8 foot long hose and fuel nozzle on the 5 gallon fuel can. I then place the fuel can in the bucket, raise the loader to max height, then open the nozzle and fill my tractor. Rather than use a pump, I let gravity do the work. I did this by drilling a 1" hole in the side of the fuel can, near the bottom. (about 2 inches up) I then installed a fitting in the can, which my hose attaches to. The only drawback is that if the tractor should run completely out of fuel, this system won't work, as raising the bucket wouldn't be possible. Hopefully, I'll never run it completely dry. Creativity over Capital. I like hearing about neat ideas like that! Bialecki,I like your diesel caddy, but I'm just too cheap to go buy one. I'll bet someone who has a mig welder can fabricate a similar setup minus the pump for less than $100.00. Combing some comments here: could you not use your FEL to unload the filled FUEL CADDY from your pick and eliminated the 5 gallon cans or is transporting it a pain due to it sitting up? Farmer here used a lot of fuel and gas tanks set on racks and let gravity push the fuel to the tractors. That worked fine until the tractors got bigger and taller but worked fine on the Ford 601, MF 135 and such. 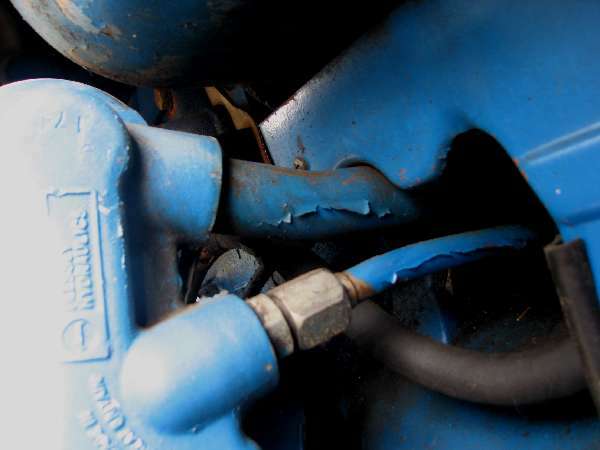 Joel, all you have to do is put a tire (Schrader type) valve through the lid and put a couple of pounds of air in the jerry can and the diesel will flow uphill no problem. Making a diesel (or most other) tank isn't as easy as you'd think, it takes only a VERY tiny hole for fuel to slowly weep through it. Besides, with the price of steel these days I suspect your $100 estimate is a long way off the mark.